Jeff Galloway, the former 10,000-meter Olympian (1972) and best-selling author, came to visit Runners Roost in Fort Collins today, and it turned out his talk was very relevant to my latest posts about endurance sports, injuries and health. Galloway’s secret? His now-famous running-and-walking approach. I.e., for long runs and even races, frequently alternate running with walking. “The walking resets the body’s fatigue-o-meter back to zero,” he purported. In addition, for most people, interspersing one mile of running with one minute of walking only causes them to lose about 15-20 seconds, since during the minute of walking they are still making forward progress. He claimed that his method has been so effective that a friend of his even won a 48-hour endurance race with it (by running two minutes and walking one), even though with about 10 hours left in the race, he was 11 miles behind the leader! Hmmm, I think it is something I will try for my next 100-mile run attempt. Running too fast: He says this is one of the biggest causes of injury. Therefore, he doesn’t even recommend doing track work above a certain age that varies per individual. Running/walking: Running continuously will fatigue oneself, but so will walking continuously. Therefore, he advocates alternating back and forth to minimize fatigue. He didn’t prescribe specific amounts (lengths of time for walking/running), saying that each individual should determine that. The “Magic Mile”: He advocated doing a mile run a few times and recording the times. From the best mile time, he said that he could pretty accurately predict (and specify) what one’s 5k, 10k, half-marathon, and marathon pace should be based on data from thousands of his runners. Stretching: Don’t do it. In the 80s he would recommend stretching since all the other “experts” were doing so, but then he realized many of his protégés were getting injured because of it. “Stretching is the leading cause of injuries among people who stretch,” he said. “It’s way above the number two cause.” He even recommended NOT doing yoga or pilates. Training year-round vs. having an off-season: Galloway favored training year-round, saying that there is no reason to have to take time off aside from mental ones. He believes it is possible to run year-round without getting injured. Trails vs. pavement: He enjoyed running on trails, but said that 20% of runners will get injured running on trails due to weak ankles. 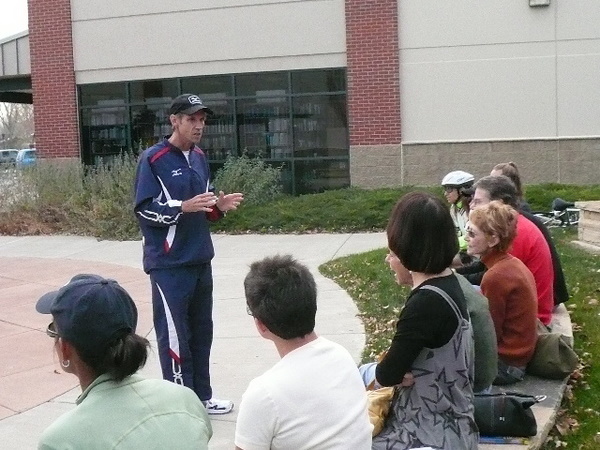 He especially thought it was important to train on pavement if training for a race that was going to be on pavement. Hills: According to Galloway, running uphill is super safe to do since it forces one to slow down. He cautioned running downhill, though, saying a big mistake is taking too long strides. Favorite marathons: He really thought the Colfax one (Denver) was well-organized. Most beautiful he’s done was the Big Sur Marathon near Santa Cruz, California. The one offering the best hospitality was the Disney one in Orlando. One he particularly enjoyed—one that often gives him the chills for being on such historical ground—is the original marathon course in Athens. Running form: Good posture is important, with the body upright, the torso directly over the hips and the hips over the legs. One should run low to the ground—running high off the ground results in wasted energy and higher impact upon landing. Fast runners typically have pretty short strides but high cadence. He refused to declare an “optimal cadence,” saying it varied for each person. Race nutrition: During races, many of his runners would consume about 3/4 of a pack of gel every mile or so (with a couple of swigs of water), starting at about Mile 6, to keep their blood sugars up. Many would fill a flask up with gel and top it off with some water and take swigs from that every mile. Amount of sleep one gets before a race: Completely unimportant. He says worrying about the quality of sleep before a race is worse than not getting enough sleep the night before. He’s done plenty of races on no sleep with no degradation in performance. He’s run 135 marathons. The first 65 were competitive; after that, he would follow what he preached a lot, namely run-and-walk. This was the second time I’ve been at one of his talks, and both times I was very impressed with him. Apparently, he also wrote a book entitled Running Until You're 100. I think I’m going to have to read it sometime. It was a great talk and to top it off, I won a prize—a training diary conceived by Jeff. He even autographed it for me. Cool.